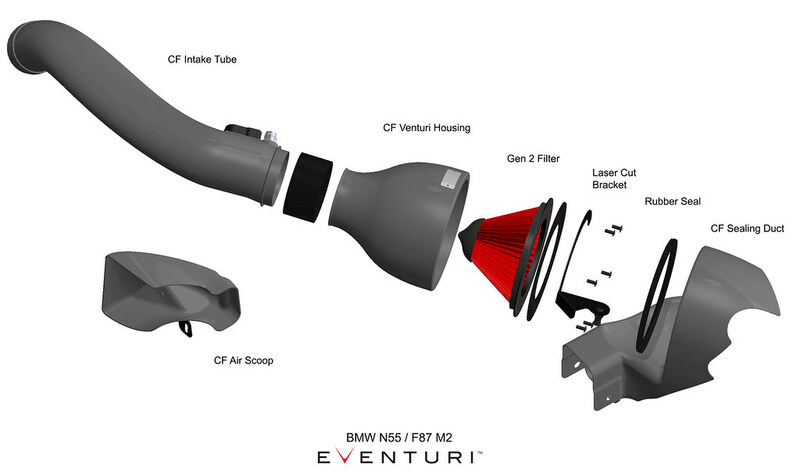 Our updated F22 N55/M2 Eventuri intake system is a perfect example of our “Complete System” principal. It demonstrates the perfect balance between allowing for unrestricted airflow to our Venturi housing and cold air saturation with our scoop and new sealed duct combination. The new sealed duct and heat shield combination ensures that engine bay heat is kept away from the filter and therefore IATs are kept to a minimum. 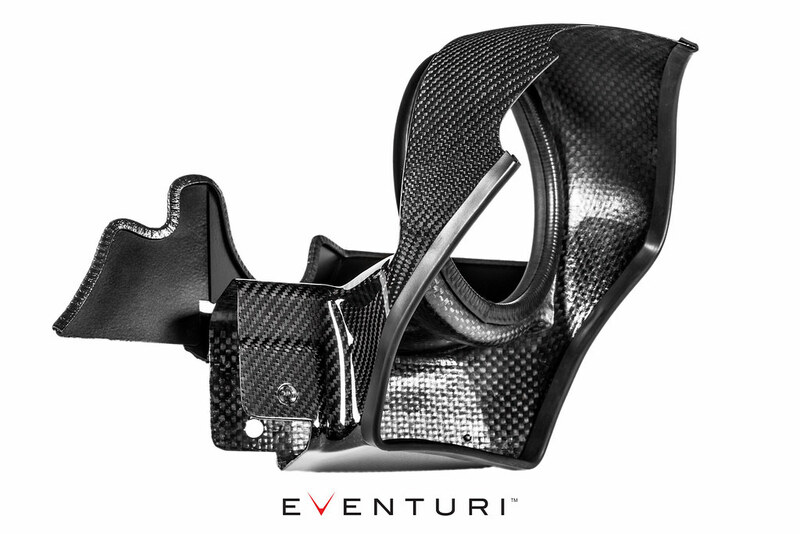 Every detail has been meticulously developed from the prepreg carbon pieces to the precision bracket work. This intake sets a new benchmark in design and craftsmanship for the F22 and F87 platforms. Also fits the M135i and M235i with the N55 engine. The M2 Eventuri system uses our Patented Housing which provides an aerodynamically efficient airflow path from the filter to the MAF tube. Not just another cone filter with a heat shield but a unique design which invokes the Venturi effect. You can read more about the housing design and how it works HERE. 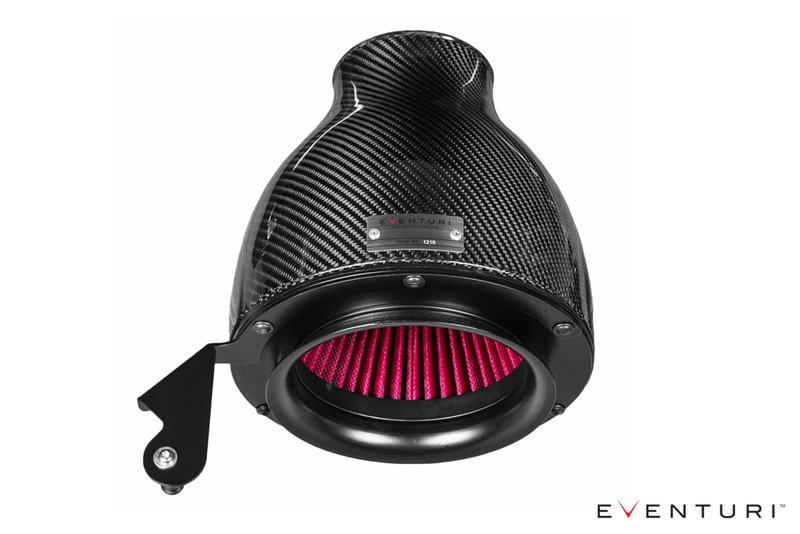 The filter housing comprises of a high flow filter, aluminium cowl, laser cut bracket and the carbon pod itself. The carbon pod shrouds the reverse mounted filter and smoothly shapes the airflow down to the intake tube. This smooth reduction in cross sectional area invokes the Venturi effect where the airflow accelerates whilst maintaining laminar conditions. It can be thought of as a large velocity stack - below is a diagram to show the comparison between our patent pending design and a regular intake system. Further details can be read in the Technology page. 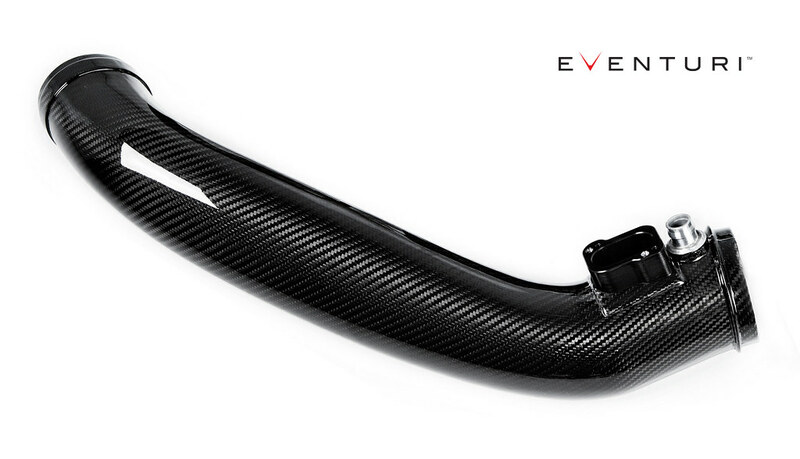 Our intake tube is crafted from 100% prepreg carbon fibre. Each tube has an integrated MAF sensor mount and breather adapter which are CNC machined from aluminium. The inlet tube has been designed to provide a smooth path for the airflow to negotiate from the filter to the stock turbo tube. In order to clear the fan shroud we smoothly transitioned the cross section from a circle to an oval and maintained constant area. This ensures the airflow remains laminar and allows the turbo to function with minimal drag. The scoop was designed for maximum efficiency in directing the incoming air to the stock duct openings. Many aftermarket scoops have a large flat area almost perpendicular to the oncoming air - not great for channeling it into the ducts as the airflow just "hits" this flat portion and creates turbulence. 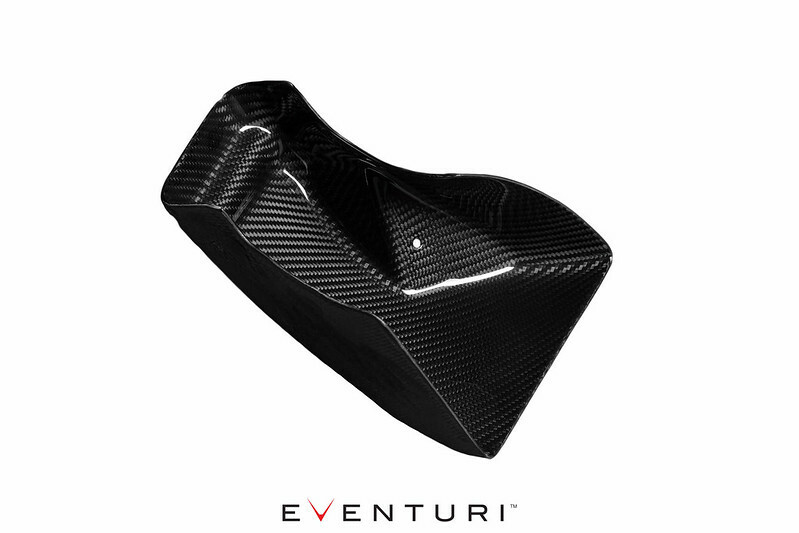 The Eventuri Scoops have been designed to sit directly behind the front grills to capture as much air as possible and with a continuous curve to the duct opening to ensure this airflow is efficiently channeled. Having an effective cold air feed to the filters is an essential part of our design. Simply having some heat shields in place is not an effective means of avoiding heated air from entering the filters unless the shields create an air tight envelope around the filters. The scoops and ducts in our system combine to provide the filter openings with ambient air and maintain low intake air temperatureThe following video explains the design features.